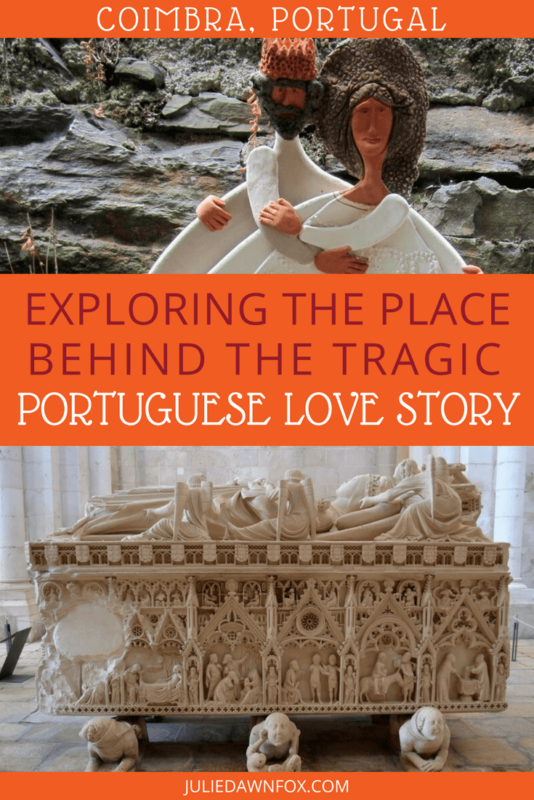 Long before Shakespeare created Romeo and Juliet, Portugal had its own real life romantic tragedy within the royal family in the shape of Pedro and Inês. Their love story has become legend and inspiration for poets and artists throughout the ages. With each telling of the tale, it becomes harder to differentiate between fact and fiction but the elements of forbidden but everlasting love remain at its core. And what better place to learn about their romance than the place where they met and played out their romance? That’s why I went on a guided walk through the woods and botanical gardens of Quinta das Lágrimas or ‘Estate of Tears’ in Coimbra. Nowadays, the Quinta das Lágrimas is a luxury hotel but it was once the site of the royal palace and the backdrop to Pedro and Inês’ affair. And I do mean affair. At nineteen, Pedro, son of King Afonso IV and heir to the Portuguese throne, was married off to Constança of Castille in order to seal an alliance between Portugal and Spain. 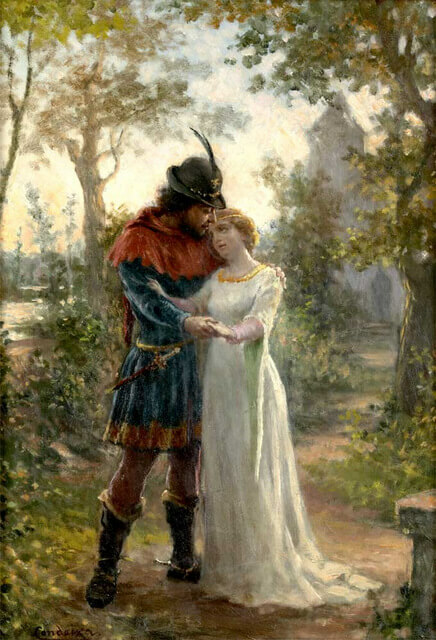 The problems started when Pedro fell madly in love with Constança’s lady-in-waiting, Inês de Castro. His feelings were reciprocated and their relationship became an ill-disguised secret. Constança tried to discourage them by making Inês godmother to one of her children, thereby making her involvement with the child’s father, Pedro, incestuous but even this wasn’t enough to keep Pedro and Inês apart. They had four children of their own, by which point their relationship had seriously soured King Afonso’s alliance with Castile. Constança died in 1349 but despite his father’s urgings to remarry, Pedro was only prepared to marry Inês. She wasn’t considered worthy of the throne and his father forbade the marriage. Pedro still refused to marry anyone else and King Afonso, at his wits end, took advantage of Pedro’s absence one day in 1355 and sent three assassins after Inês. 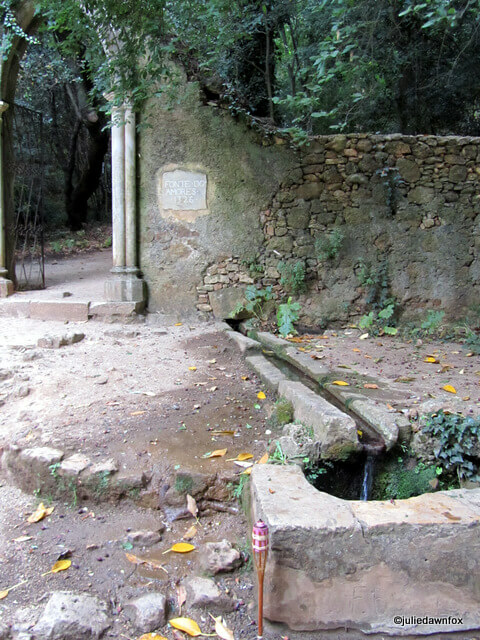 The place where she is said to have been killed was later dubbed the ‘Fonte das Lágrimas‘ or ‘Fountain of Tears’. 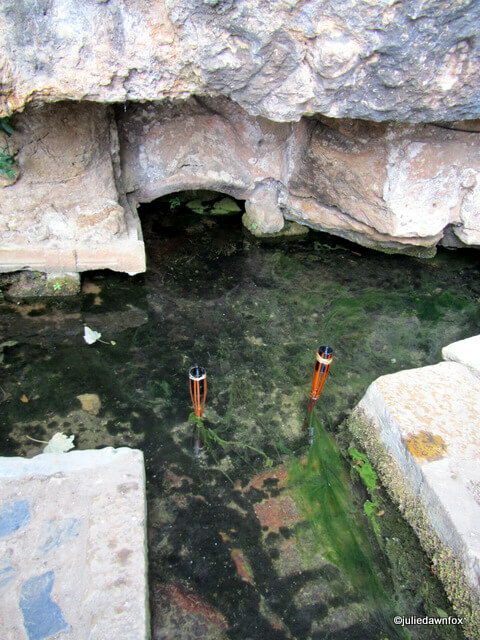 There is a small natural spring here which feeds the estate’s farmland through irrigation channels. At its mouth, thin grasses sway in the flow of the water, representing Inês’ hair and the stones under the water have a reddish tinge as a result of her blood being shed. 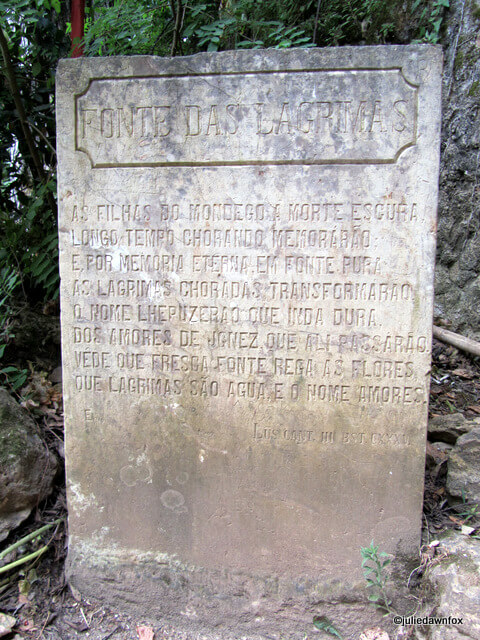 A poem is carved into a stone plinth next to it, informing visitors that the fountain and stream symbolise the river of tears cried by Pedro at the death of Inês. And that with the eternal quality of true love, these tears continue to give sustenance to the flowers and trees in the very gardens that bore witness to their passion. It was Pedro’s grandmother, Saint Queen Isabel, who had ordered the irrigation channels to be built to supply the vegetable gardens of the palace and neighbouring convent. If you eat at the Quinta das Lágrimas hotel, you could well be feasting on the food of love because its kitchen garden is still fed by these channels. There is a point along these watercourses, near one of the secret passageways that Pedro and Inês supposedly crept through to meet up in the woods, which is known as the ‘Pipe of Love’. Our guide, Branca, invites any loving couples to step forward. According to the legend, if two people in love simultaneously drink the water as it pours from one channel to a lower one, their love will be everlasting. No one takes her up on the offer and I’m not surprised. It would take some very complicated and undignified positioning to accomplish the task. Pedro’s love for Inês lived on after her death and he waged war against his father for having killed her. 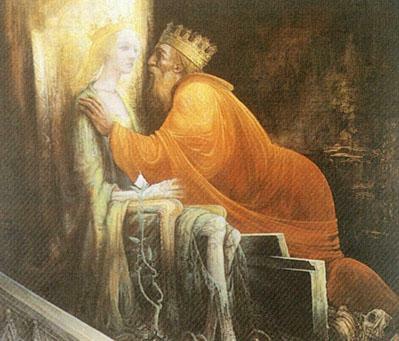 He never forgave his father and when he became king in 1357 he had Inês’ body dug up and crowned as queen, claiming that they had married in secret before she died. The legend says that after forcing the members of his court to kiss her decomposing hand and swear allegiance to their new queen, Pedro tracked down her assassins and killed them, ripping out their hearts with his bare hands. 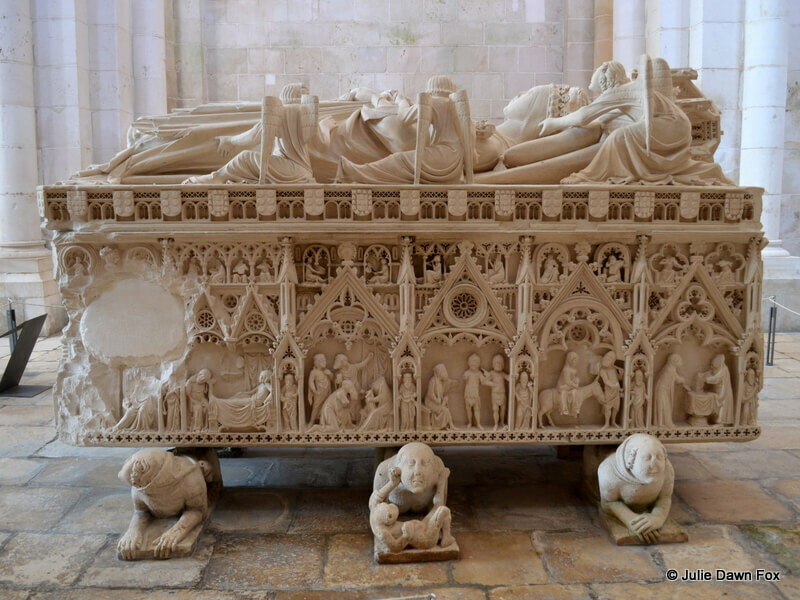 To ensure they would be together in the afterlife, Pedro installed Inês’ body in the monastery of Alcobaça and had his own sarcophagus placed at the foot of hers. The attention to detail on the matching tombs is further evidence of Pedro’s devotion, with exquisite carvings of scenes from their lives together. 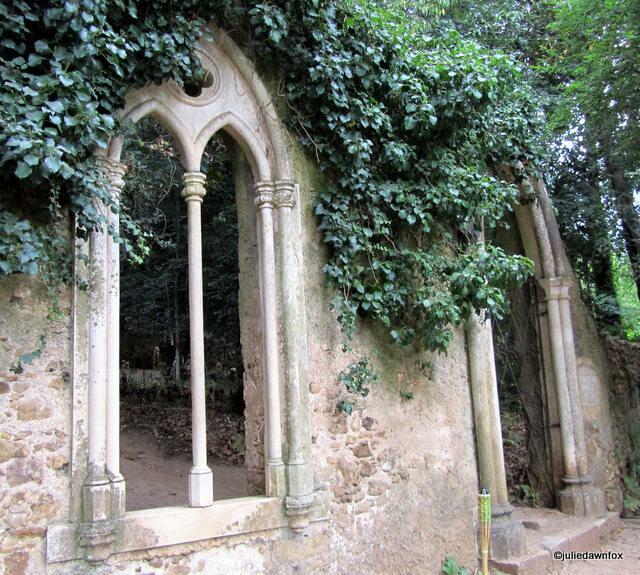 If you just want to take a guided tour of the grounds at Quinta das Lágrimas, you need to book ahead on +351 918108232. The gardens are open Tues-Sun from 10am to 5pm in winter or 7pm in summer. 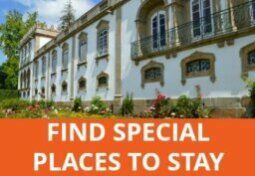 You’ll find other suggestions for things to do in Coimbra in this post. Disclosure: Some of the links in this article are affiliate links. 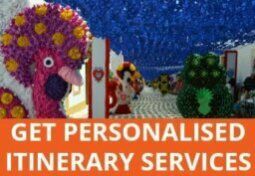 This just means that if you book through them, you’ll pay the same, if not less and I may receive a small commission to help keep this blog running. There are so many different versions of the story that it’s impossible to know the truth, I think. I can understand why communities would want to cling to the versions that suit them, though, especially if they get an annual festival out of it. The king sounds a bit dodgy though! You must realize that this happened about 650 years ago… enough time to jump from historical facts to other fields, like the literary, mythological and even political ones. For instance, most of what you said belongs to the ever-growing myth, like the placement of the tombs and their related story, and the ceremony of the kissing the hand of the deceased Inês. Their myth grew much around the discussion of her crown on the tomb – were they really married or not? Some say they were. Some say they weren’t. This historiography discussion started at least in the XV century. That discussion was soon in different fields, and there were enough intriguing motives around their lives, like death, love, treason, and so on, to be covered by poets and playwrights. Pedro and Ines’ relationship is probably one of the most important myths in Portuguese literature, much richer than the actual events. What a touching and sad story. To exhume her body and make his staff honour her is a real touching (although freaky) gesture. Sadly this story reflects the brutality of times gone by and the steps people take for honour in the family and royal/political complications. It truly is a powerful love story, made sadder by the lengths both Pedro and his father went in different directions. I think the exhumation was a step too far, though! I have had the pleasure of visiting the Monastery of Alcobaca and have seen the beautiful sarcophagi, which are placed feet to feet, and legend also says they were placed such, so that when they rose in the afterlife the first face they would see would be each other’s! I still haven’t seen the tombs in person but they’re on my list of things to see. The photos I’ve seen of the sculpted sarcophagi are stunning so I’m sure they’re even more impressive up close. What a wonderful love story. I would still love to believe true love like this exists! I’m sure it does, although I think the line should be drawn before exhumation! Oh what a beautiful love story – so tragic! You told it so well, it was as though I had come upon it in the pages of a book on myth and legend. It put me in mind of Arthurian tales. 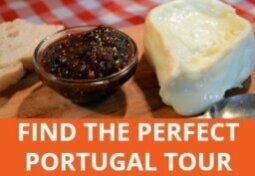 What a rich and beautiful history Portugal has. I’ve always loved the name Inês too. Just beautiful. I’m from Coimbra and quite proud on reading such an accurate and passionate view on our most famous people by a foreigner. Thank you! It’s an incredible tale and well worth telling so I’m pleased you think I’ve done an acceptable job of it. what a powerful story of love, and you told it so eloquently it jumped off the screen at me! Thank you! I’m really glad you enjoyed it. It was fascinating for me to find out about their tragic story. Portuguese people grow up knowing about Pedro and Inês but I only heard of them when I moved here. 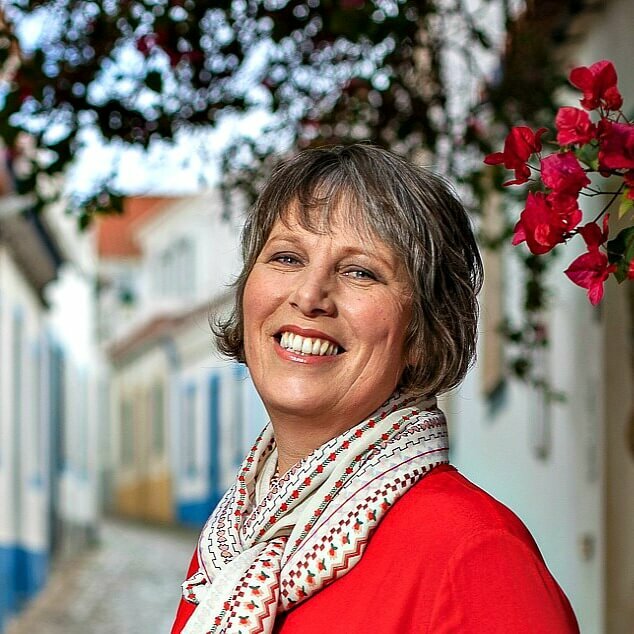 I learn from you amazing stories about Portugal, I’ll keep them in mind! (Pedro). Good story – nice pictures!